The 100 Years of Loss exhibition is on display in the John E. Robbins library until Oct. 20, 2017. Brandon University (BU) is hosting a visiting national exhibition that explores the ongoing impacts of the Residential School System among Indigenous (First Nations, Inuit, and Métis) Peoples in Canada. 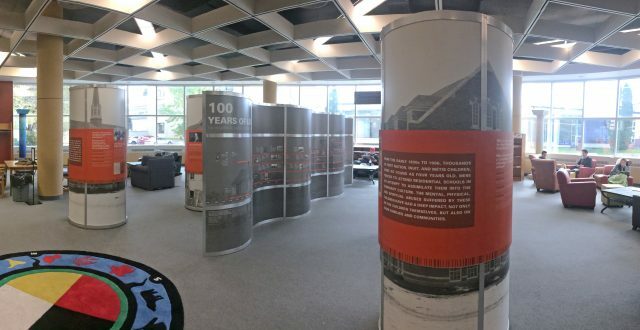 The exhibit, 100 Years of Loss: The Residential School System in Canada, will be placed in the Gathering Space on the first floor of the John E. Robbins Library at BU, where it will be open to the public throughout normal library hours from now until Oct. 20. 100 Years of Loss was developed by the Legacy of Hope Foundation as part of its education program. An opening reception will formally launch the exhibition on Friday morning, Sept, 29. Local dignitaries and the public are invited to attend for smudging and prayer, beginning at 11:30 a.m., as well as brief discussions on the importance of this exhibit as well as reflections on the legacy of the Residential School System in Canada. Refreshments will be provided, including a bannock and stew luncheon. The opening of the exhibition is also timed to coincide with Orange Shirt Day, a nation-wide opportunity to remember and honour Residential School Survivors in a spirit of reconciliation, using the slogan Every Child Matters. Complimentary parking has been arranged for visitors to the exhibit in Brandon University Lots 5 and 6, located at 20th Street and Princess Avenue. Brandon University welcomes groups who are interested in attending to learn from the exhibition, and asks them to pre-register to prevent over-crowding. Bus drop-off and pick-up is also available. Registration is as easy as contacting Becky Lane at LaneB@BrandonU.ca or by phone at 204-727-9767. More information about the exhibit, including resources for educators, is available online at 100yearsofloss.ca. Educators can also take advantage of nearby, separate teaching space in the BU library to prepare their students for the exhibition, and to discuss its lessons afterward. The library has made Friday afternoons available for group visits, but groups should register with Becky Lane at LaneB@BrandonU.ca or by phone at 204-727-9767 to ensure space is available on the dates of their preference. Limited non-Friday dates are also available. For all viewers of the exhibition, the BU library has set aside a separate, private space for reflection, grief, or healing after viewing. Additional semi-private space for these purposes is also available in the Indigenous Peoples’ Centre, directly adjacent to the library in the George T. Richardson Centre.